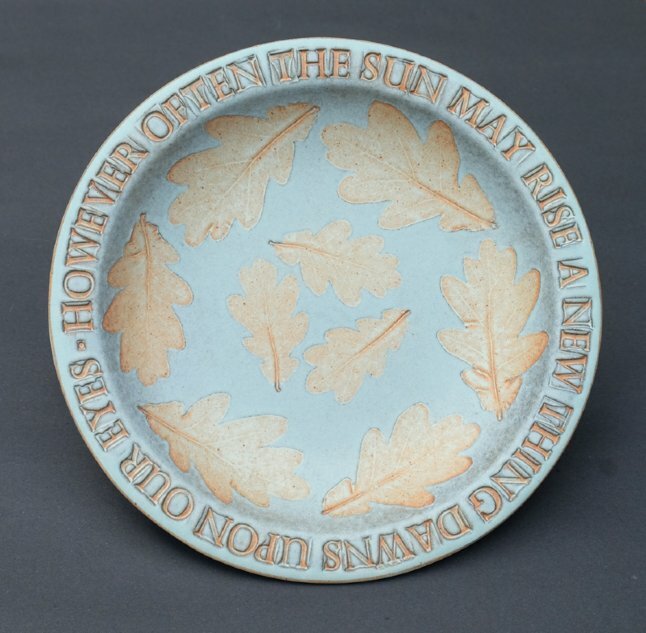 I make stoneware garden sculpture and decorated dishes, plates and tiles. The work reflects my love of the natural world. The Green man and serene wall pots are designed for use as containers with plants such as thyme and saxifrage. I enjoy making faces and ideas come from many sources – local carvings, portraits or photographs, and from my imagination. The pots are made from high fired clay and are frost resistant. The plant theme continues onto my dishes, plates and tiles. I decorate these with impressed leaves and lettering, often poetry, in celebration of beauty in nature. I have a large collection of lead and wooden type and make commissioned plates for weddings and special anniversaries. I teach regular weekly Pottery in the Fen classes at Waterbeach.